In case you were or will be walking past Boston Common anytime soon, there's some yellow tape up closing off a section from Park Street Station to the visitors center. That's because police shot someone there yesterday. 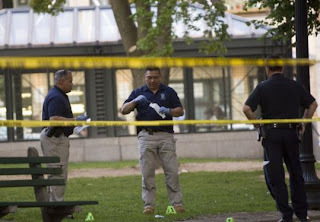 While Boston Common bustled early yesterday evening with people walking their dogs, playing Frisbee, or relaxing on park benches, Boston police chased a man they believed had a gun across a portion of the green and then shot him near the park's visitor center. As it turned out, however, the gun was a replica of a black semiautomatic. The man, whom police did not identify, was in stable condition last night at Boston Medical Center with a wound to the arm that was not life-threatening. Just out of curiousity, does this make you feel more safe to know that cops are on patrol, or less safe that they're drawing firearms and firing in a public place while the park is relatively crowded? 0 Response to "Officers Shoot Man in Boston Common"